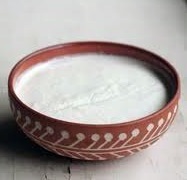 The best natural homemade probiotic foods is yogurt (curds) or dahi, as it is known and prepared in India. It is natural, made at home, has no preservatives and loaded with probiotic bacteria. Why spend 10 to 100 times more for fancy and processed supermarket or branded products? Bring half a liter of fresh milk to a boil and let it cool down naturally till it becomes lukewarm. Once the milk is warm, add a tablespoon or two of curds or fresh unflavoured yogurt to it. In case of very hot climates, one teaspoon is also enough. Let the milk rest outside for a few hours, covered with a lid. Make sure the vessel is kept in a relatively warm place and is placed on a wooden surface or thick cloth. You could also wrap the vessel with a thick towel. The other option for cold climates is to heat up an oven to around 40 to 50 degrees then shut it off. Place the vessel inside. The yogurt takes from between six to eight hours to form. Ideally, prepare this at night so that it is ready by morning. Once the yogurt is ready, transfer the vessel to a refrigerator and eat when you like. Refrigerated yogurt will last for 3-4 days without getting spoiled if it is kept well refrigerated. If you don’t have homemade yogurt to begin with, then you can also put in a piece of bread to the milk to convert it to yogurt. Making yogurt is more of observation and skill. If it is very cold you may need to put in more yogurt to the milk or let it rest more in a warm place. If it is too hot, the yogurt may turn rancid fast. So keep experimenting and arrive at your best formula. Good yogurt is well formed and completely bland. There should be no acidity when you eat it. Having this in small quantities is very helpful for acidity and digestion and also contains protein and calcium in a form which is easy to absorb by the body.